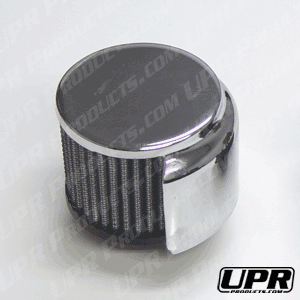 * Push in Style for 1.25"
* Cotton Filter Media UPR push in Tall Valve Cover Breather Filter fits 1.25 Inch valve cover openings and features an ultra strong molded pliable rubber base which absorbs vibration and allows for secure attachment. Filter is 3 inches in diameter and 2.5 inches tall. Quality Construction: Made with a ultra strong pliable rubber flange absorbs vibration and is flexible and features cotton filter media. No one else gives you the bold clean styling of our Aftermarket Dress Ups, Suspension and Performance Parts for your American Muscle Car like UPR Products! Installs in 5 minutes or less. Fits these Vehicles: 1979 1980 1981 1982 1983 1984 1985 1986 1987 1988 1989 1990 1991 1992 1993 1994 1995 GT V8 Mustang Roush & Saleen Vehicles.